“Like so many of the whānau and families they serve social service organisations are under huge financial stress”, says Trevor McGlinchey, New Zealand Council of Christian Social Services (NZCCSS) Executive Officer. “The support demanded from desperate people in communities is far outreaching the resources available”. 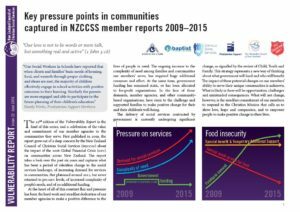 “For the last 6 years the NZCCSS Vulnerability Report has tracked the experiences of the families affected by the impacts of the Global Financial Crisis and the organisations that work alongside them. A ‘new normal’ of desperation to find housing, food and sufficient income to survive has emerged for many families”, said McGlinchey. “The members’ reports clearly demonstrate the huge complexity of client needs and the ever-increasing demand for social services”. The report shows that, apart from a short period in the 3 years immediately post the Global Financial Crisis, funding for social services has remained static yet demand has soared to higher levels than ever previously experienced. “There is a real contradiction in government support and our members’ experience. 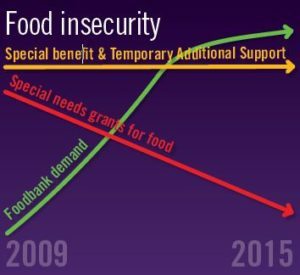 Work and Income’s Special Needs Grants for Food have decreased by 28% from December 2009 to December 2015 but the demand for food parcels has skyrocketed. Housing New Zealand waiting lists have dropped from over 10,000 (2009) to 3,500 (2015) yet the requests for emergency and social housing support have become overwhelming”, said McGlinchey. “Government has relied too heavily on the response of community organisations, charities and service providers to meet the needs of those with the least in our communities”. After six years of publishing Vulnerability Reports this is the last edition. NZCCSS has used this opportunity to look back over the last six years to expose the post Global Financial Crisis impacts on those with the least. “This is expressed through the voices of members and demonstrates that what we hoped would be a short term impact has now become the regular daily experience, the reality of life, for far too many whānau”, says McGlinchey. “The Vulnerability Report has made an extremely useful contribution in tracking these impacts and I thank all contributors. Given the ‘new normal’ we are further developing the way we gather evidence of the experiences of our members and the families and communities they serve. This evidence will inform a new style of report”. The services provided by community organisations are a critical component in the lives of many families. The needs of families have required service providers to employ highly qualified and experienced community workers, social workers and counsellors. However, there has been no increase in funding. In fact it has been eight years since there has been a sustained increase in resources for community-based service providers. Denominational Representatives of the New Zealand Council of Christian Social Services are meeting at Kōkiri Marae, Seaview, Lower Hutt to further discuss these issues today 23 June, 2016. New Zealand Council of Christian Social Services is the umbrella group for the social services of the Anglican Care Network, Baptist Churches of Aotearoa New Zealand, Catholic Social Services, Presbyterian Support NZ, the Methodist Church and the Salvation Army.